As an independent board certified patient advocate I work with clients to help them navigate the choppy waters of the healthcare system. As patients, we have rights and responsibilities. Choice is one of the most significant of those rights. We can choose who our provider is, where we receive care, by whom, what treatments we consent to and those we don’t. We also have the right to choose whom will carry out our healthcare wishes should we be unable to express them for themselves. One aspect of my work involves helping clients prepare for medical appointments. Although everyone’s needs are unique, one consistent theme in appointment preparation is the concern that the patient will have an extremely limited amount of time to interact with their medical practitioner. The best way to make sure we get the most out of our medical appointments, so they meet our needs and goals, and reflect what is important to us, is to prepare and plan. That’s also what is so valuable about advance care planning. Having the conversations proactively at times when one is not in crisis or facing a medical emergency, means that you have the opportunity to have thoughtful and intentional conversations about your health care wishes so that the information is known to those most important to you. Too often family members are afraid to have these crucial conversations. No one wants to think about those we care about the most experiencing a health crisis or needing to make end of life choices. The questions that arise during these conversations aren’t easy, the answers aren’t simple, and it’s likely those we hold dear do not know everything we want them to. Thoughtful and deliberate planning helps take our wishes about our health care plan and moves them from our heads and hearts to papers that can be shared/distributed and kept on file so that they are accessible to those we choose. We need to start thinking about these things and discussing them from the time we are 18 years old. 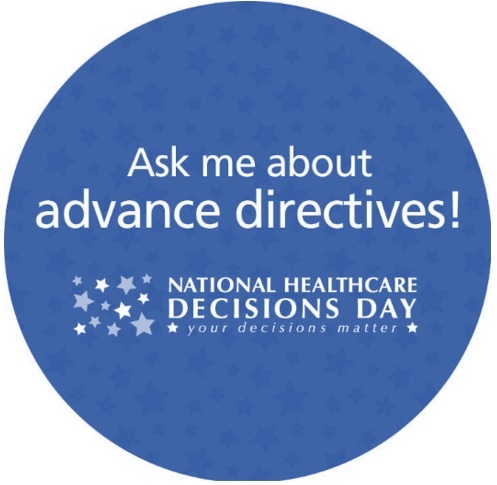 There is much to think about when it comes to the creation of your advance directives. Remember, these documents are documents you can change at any time. They’re yours. Make sure they remain up-to-date. Making plans and sharing your wishes when you are fully able to do so is a gift you can give those you care about and care about you. AN ADDITIONAL NOTE YOU MAY NOT BE THINKING ABOUT: Anyone 18 years old and older is considered a legal adult and the HIPAA privacy laws regarding protected health information apply. Make sure that your child, grandchild, niece, nephew, or family friend has completed a Health Proxy Form and that you have a copy of it. Accidents and the unexpected happen at any age and in a time of crisis the last thing one wants to deal with is the red tape of getting medical information about a loved one. This is often something that is overlooked when a young adult is not living locally. - Please Note: A Living Will / Personal Directive is not a legally binding document in Massachusetts, but is extremely important to complete as it reflects your wishes in great detail. Here’s a Personal Directive to view. Do you need help with advance care planning? Contact Beacon Patient Advocates LLC to help you gather the resources you need.